Bakson's Tonsil Aid Tabletis a homeopathic remedy that has a unique composition and it is time-tested, clinically tried and well-known for relieving inflammed tonsils. It is indicated in tonsillitis, pharyngitis and sore throat. It also helps in lowering mild to high temperature of the body. 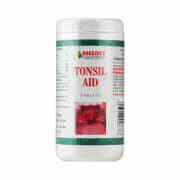 Take 1 Bakson's Tonsil Aid Tablet 3-4 timea a day or as prescribed by the physician. A licensed pharmacy from your nearest location will deliver Bakson's Tonsil Aid Tablet. Once the pharmacy accepts your order, the details of the pharmacy will be shared with you. Acceptance of your order is based on the validity of your prescription and the availability of this medicine.